Studying cultural relativism is considerably easy, but applying it in a world where intolerance and oppression come easy is a lesson in empathy. This is a piece which will help you find out what minority communities’ students experience in the educational hub of the country. democracy, though, is ideally supposed to be inclusive and fair to the minority’s desires and choices as well. So, what is the way our education system treats the minority groups in the time of politically motivated communal and religious intolerance? individuals and this stumps the factor of representation. DU were of no help because she had no access to the Internal Complaints’ Committees as a student of SOL. Numerous people feel a sense of insecurity in ‘fitting in’ with the crowd at DU, and even undergo mental health problems in lieu of this desire to be a part of a circle. 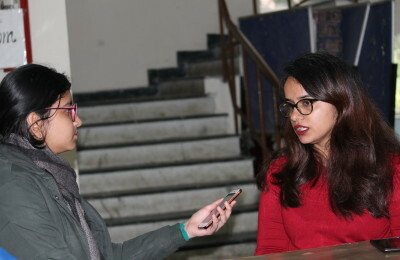 One student of Hansraj College revealed on the condition of anonymity that she/he had to visit three different psychiatrists in three semesters because of the mental health issues their minority identity presented in DU. The psychiatrists were seldom understanding of the crisis, they stated, and most people do not even have the privilege of availing therapy. There are some safe spaces in the city for revisiting this form of one’s identity. Kartik Chauhan of Hindu College states,“However, there are some places like the Meraki events, where Northeastern Indian students meet each other. home.” Nida from Lady Shri Ram College finds her safe space in Jamia Masjid Area at Chandni Chowk, while some responders feel there is no real escape from this lack of empathy. environment where they can feel at home. Feature Image Credits: Niharika Dabral for DU Beat.